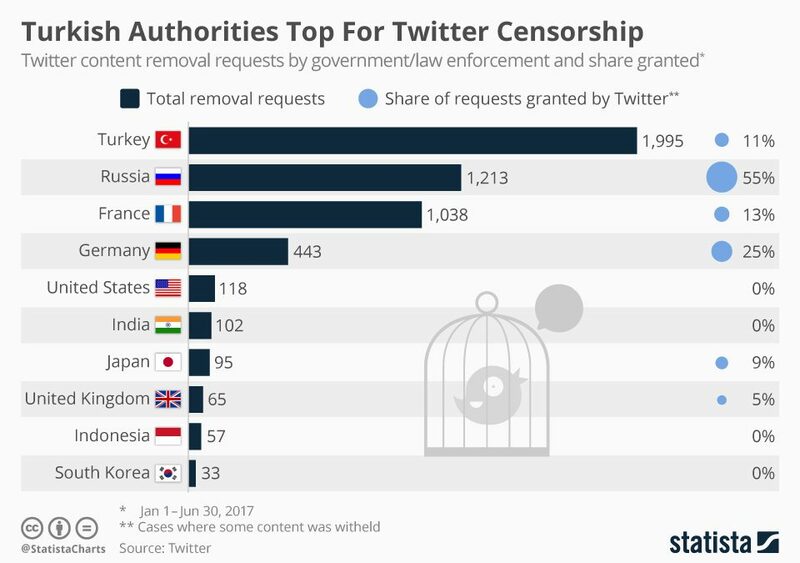 Turkey came first in the Twitter’s censorship index by content removal requests that the microblogging company received worldwide in the first half of 2017. A total of 1,995 content removal requests were filed by Turkey’s government agencies including police and other institutions, making up 37 percent of the total number of such requests made globally between Jan 1 and June 30. Russia came second with 1,213 requests, France third with 1,038 requests, Germany with 443 requests and the US with 118 requests. Removal request with court orders was separately categorized with Turkey topped this list as well, being by far the most censoring country in the world with 715 requests. Brazil was ranked in the second place with only 14 requests. Meanwhile, Twitter complied with 11 percent of Turkey’s requests and with 55 percent of those by Russia. As a result, 204 accounts and 497 Tweets in Turkey were withheld in the first half of this year. According to Twitter, Turkey also sought information about 554 users, 12 percent of 2,526 such requests worldwide. The chart above was produced by Statista.